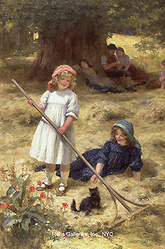 The demand for pleasant genre scenes and images of bygone days were in great demand during the height of the Victorian era and many artists looked to fill the need; one of these artists was George Sheridan Knowles. Not much is known about his early life, but it is believed that he spent his youth in the Manchester area and most likely received his formal training there. Knowles exhibited his earliest works in Manchester in 1883 and was residing at 117 Moss Lane, West, Manchester. 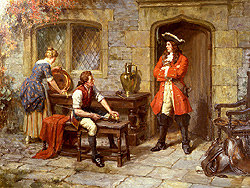 It is likely that Frederick J. Knowles (a British landscape and figurative painter) was his brother and Juliet Knowles (a Victorian still life artist) was his sister since they also gave the same address in Manchester when they began to exhibit their works in the 1880’s. Knowles was an Academic artist and like many of his contemporaries, he combined his formal academic training with the new style and color of the Impressionists to create his finished works. While his paintings conform to the realistic depictions one would expect to see from an academic master, his use of bright colors and quick brush strokes display his interest in the more contemporary movements of the period. Capitalizing on his artistic talents, Knowles specialized in contemporary sentimental genre scenes and costume pieces - set in the Middle Ages or the 18th century. 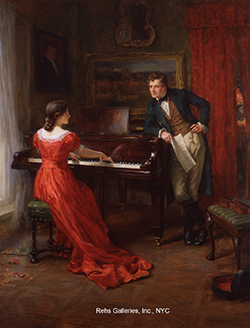 His sentimental genre paintings often capture his subjects in a relaxed, or playful, moment and are reminiscent of the works of Arthur John Elsley and Frederick Morgan (two of his contemporaries). He often derived his inspiration for his costume paintings from history and literature and were similar in style to the works of Edgar Bundy, Frank Moss Bennett and Arthur D. McCormick. By 1885 Knowles was living in London at 21 Howland Street and began to exhibit in all of the major exhibition halls. He displayed his first work at the Royal Academy (RA) in 1885 and continued to show there until 1919. 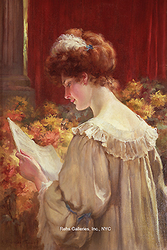 Among the works exhibited were Companions (1889); A Fairy Tale (1892); The Wounded Knight (1895); The Love Letter (1900); Dolce far niente (1907), A Love Song (1915) and An Old Gateway (1919). By the end of his life, he had exhibited more than 30 works at the Royal Academy. 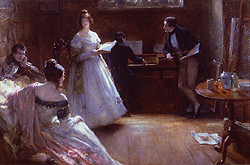 He also began exhibiting at the Royal Society of British Artists (RBA) in 1885 with his work A Spanish Lady. 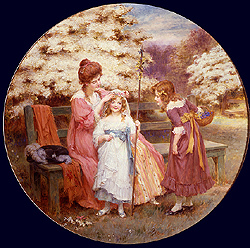 Knowles was elected a member in 1891 and continued to exhibit his works at the RBA until 1895; among them were The Orchard (1890); Cat’s Cradle (1891); The Last Minstrel (1892); Daffodils (1892); Ferdinand and Miranda (1893); The Love Letter (1893/4), Intruders (1894); Little Bo-Peep (1894) and In Shadowland (1895). Knowles was also a member of the Royal Institute of Painters in Watercolours (RI) – where he exhibited 108 works; the Royal Institute of Painters in Oil-Colours (ROI) – where he showed 91 works, and the Royal Cambrian Academy (RCA) – where he displayed 42 works. In addition to these major London exhibition halls, Knowles exhibited at the Walker Art Gallery, Liverpool (28 works), the Manchester City Art Gallery (32 works) and the Glasgow Institute of the Fine Arts (3 works). As with all our ‘Virtual Exhibitions’ the works illustrated below have been sold – they are displayed here for your enjoyment.